No child was ever in danger in the creation of this portrait! This was created from five separate images that were blended in post-processing. Creating composited portraits gives us the opportunity to venture beyond what is possible or practical in real life. The little girl sitting on the stack of whimsically arranged chairs was actually supported by scaffolding with her dad and mom standing right next to her. She got just a bit nervous at one point but with dad right there handing her new books to read, she felt safe and secure. 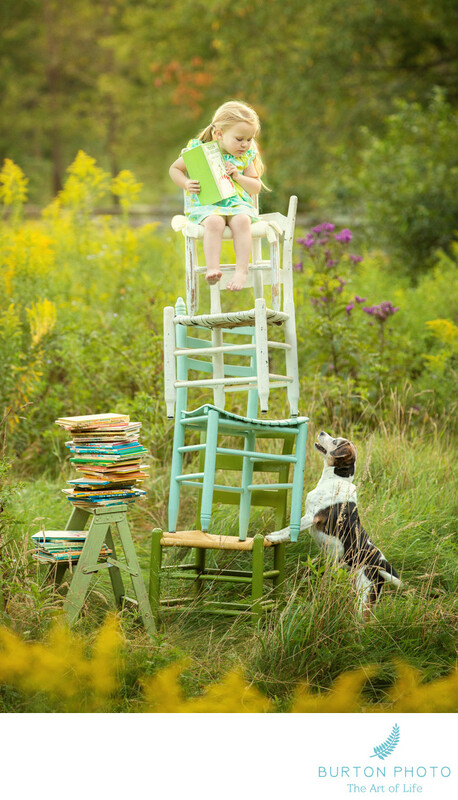 We loved including Patches, the dog, mom and dad's old children's books, and the antique ladder back chairs. The flowering field in Banner Elk provided a pretty backdrop.